The pre-launch hype was almost unprecedented – generating excitement and anticipation without actually revealing anything about what was to come. It could have been a gigantic anti-climax, but the long-awaited reveal of Celebrity Edge surpassed all expectations. 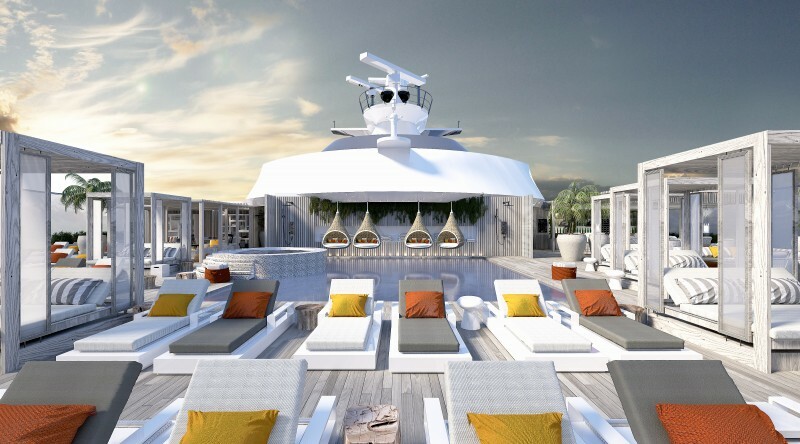 The design of this next-generation cruise ship is truly transformational – the word preferred by Celebrity president and CEO Lisa Litoff-Perlo and her boss, Royal Caribbean’s Richard Fain. Design ambassador Nate Berkus, who presented yesterday’s event in Miami and stole some of the thunder from British designers Kelly Hoppen and Tom Wright, called it revolutionary, and few would argue. 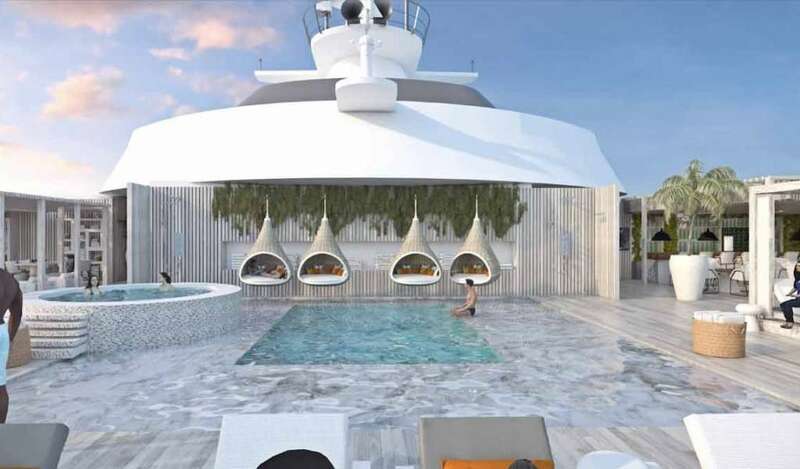 The vessel, built to carry around 3,000 passengers, turns traditional shipbuilding concepts inside out, allowing for virtual balcony staterooms that simultaneously open up the connection with the sea while creating extra space for living and sleeping. 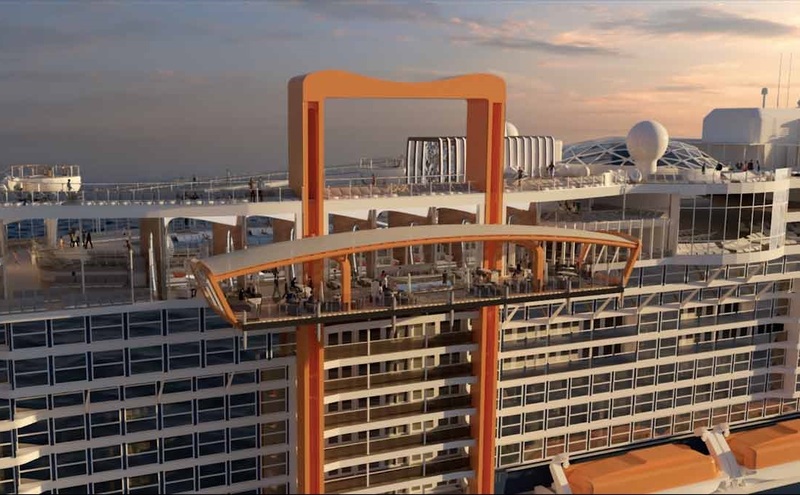 Even more spectacular is the Magic Carpet, inspired by the magician that is Richard Fain – who has already been behind innovations such as the Central Park on Royal Caribbean’s Oasis-class ships, the NorthStar observation pod on the Quantum class, and the living lawn on Celebrity’s Solstice class. tenders to be carried ashore has developed into an unprecedented 90-ton construction – the size of a tennis court – that rises from Deck 2 to Deck 17 and will also be used as a bar and a restaurant. Edge, the first of four ships in the class, is being built in France and will make her maiden voyage in December 2018. Celebrity Beyond follows in 2020, and the other two arrive in 2021 and 2022. There will be a total of 1,467 staterooms, with 176 of them designated as suites. For the first time on a Celebrity ship there will be designated accommodation for solo travellers. There were to have been eight single cabins but the number was doubled last week at Fain’s insistence. Hoppen has been involved in creating much of the look of the ship’s interior, from cabins to the exclusive Retreat area for suite guests, and even the public toilets aboard the ship. Architect Tom Wright, who was responsible for the Burj al Arab and the Jumeirah Beach resort complex in Dubai, worked on the Magic Carpet and also created the Solarium and the Rooftop Garden. Edge’s pool deck has been re-named Resort Deck, and most of the sunloungers are placed to look out to sea rather than inwards to the pool. Instead of the usual jogging track one deck above the pool, Edge has a sweeping quarter-mile figure-of-eight track that swoops between two levels. Two hot tubs rise above the pool in constructions that look like a cross between a tulip and a martini glass. Truly spectacular. Edge borrows from, or perhaps improves upon, the top-of-the-range suite on Regent Seven Seas Explorer – dubbed the world’s most luxurious cruise ship – by having two vast forward-facing suites immediately above the bridge. Fain has booked one for his own family’s Christmas holiday in 2018, but Lutoff-Perlo had a twinkle in her eye when she announced that the twin suite had been booked and sold within minutes of Edge’s Caribbean cruises going on sale yesterday. Celebrity is working on a smartphone app that they say will replicate the medallion technology announced earlier this year by Princess Cruises – allowing remote-control ordering of drinks and unlocking cabin doors without the need for a keycard. Other innovations include facial-recognition technology that lets passengers check in without having to queue at a desk. Fain claims that many of the design innovations on Edge are the result of using 3D computer technology instead of having everything drawn in 2D blueprints. He is too modest. The technology might be an invaluable tool, but it cannot create. That’s down to his inspiration and the skills of Hoppen, Wright, and a whole team of Celebrity innovators … all working close to the Edge.